This post has been brought to you by Netflix. All thoughts and opinions are my own. I am a huge reader and I am doing my best to get my kids to be avid readers as well. Something that we all enjoy is watching our favorite books come to life on the big screen. Since Netflix is probably our main source of TV watching these days (it has been 7 years since we had cable), I love that they have a selection of movies based from books. My youngest son is three years old and one of his favorite books is The Very Hungry Caterpillar by Eric Carle. He has already watched the short animated film on Netflix a bunch of times and he never grows tired of it. What is especially nice is that it includes four more of Eric Carle's stories. Our twins (6) got a kick out of watching The Little Engine That Could since it is a book i have read to them countless times over the years. "Read the Book, See the Movie" and then have even more family fun with themed crafts and snacks! A crafty person I am not, but these Book-Covered Letters are simple enough for even me! If my three year old had his own room we would be all over this as we have 3 copies of The Very Hungry Caterpillar and could certainly donate one to this project. However since he shares a room with the twins and wall space is limited, I can only admire it. (Yes, I have 3 boys sharing one bedroom - feel sorry for me). These would look awesome in a baby or toddler bedroom, especially if your family enjoys Erica Carle books. Get the complete tutorial here. Family movie night isn't complete without some tasty snacks! Now that the cold weather is here, gathering the family together to watch a movie and indulge in a warm treat sounds rather perfect. 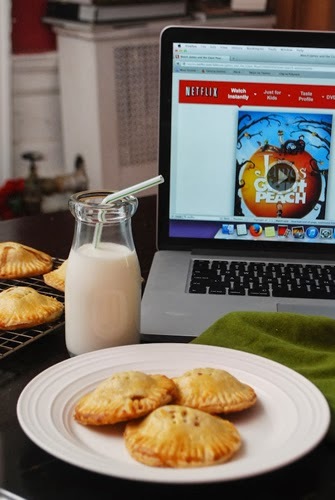 These Mini Peach Pie Pockets are inspired by the movie James and the Giant Peach. They are simple to make and the kids will love having their very own miniature pie. Get the recipe! 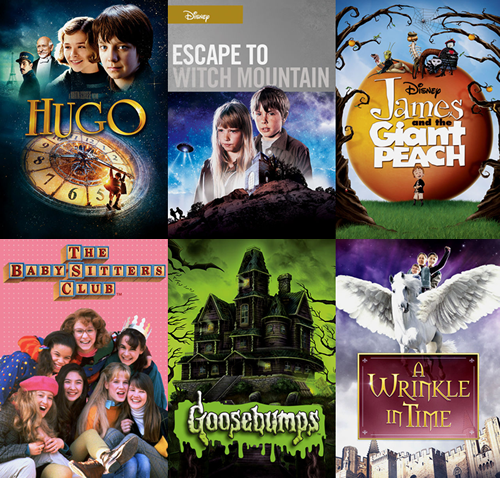 And while Netflix certainly has a great selection of kids movies and shows based off of books, don't forget they have them for adults too! With the release of Catching Fire quickly approaching in a week, I plan on getting comfy on my couch one night after the kids are in bed and re-watching The Hunger Games. 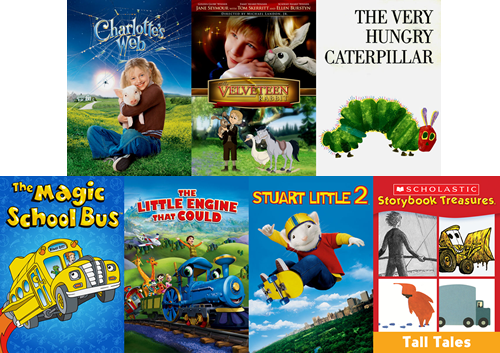 What book inspired movies do you and your family like to watch? Netflix you are doing great job.So that small baby attract to words book. We just discovered The Very Hungry Caterpillar on Netflix a few weeks ago too. My son just loves it!